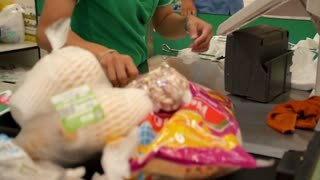 Search Results for "supermarket checkout"
Customer pays for shopping at "Tesco" supermarket checkout. 1960s: Supermarket checkout. Woman walks children to car. Car leaves parking lot. Sign “Don’t be a litterbug”. Child throws banana peel out of the car. Children throw garbage out of car on the road. 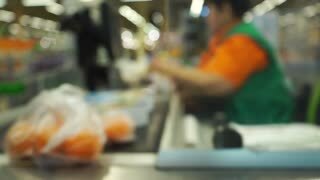 Cashier at supermarket / Retail checkout / Paying groceries. 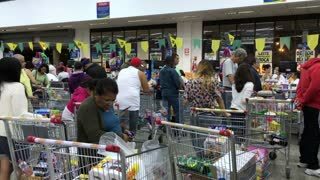 Unrecognizable buyers with carts move in queues to pay for purchases at the supermarket cashier. 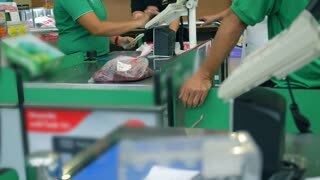 Cashier at supermarket / Retail checkout / Paying groceries. 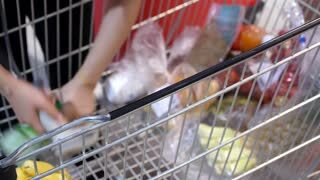 Unrecognizable buyers with carts move in queues to pay for purchases at the supermarket cashier. Fast motion. 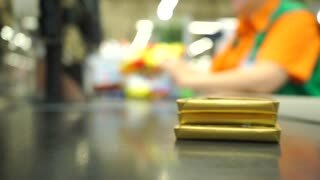 Young girl makes a purchase in a supermarket, pays at the checkout.